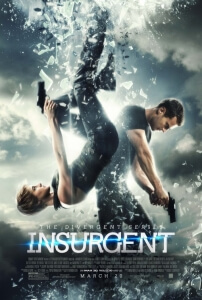 Last year’s Divergent, the first in a planned film series based on Veronica Ruth’s book trilogy, opened to a muted response from critics and audiences – in our review, we likened it to two warring soda brands in the first paragraph – with few truly caring about whether they’d be invested in any follow-ups. One year later, nothing much has changed and Insurgent, adapted from the second book entry, continues from where its predecessor left things yet doesn’t stray too far in terms of its own sense of direction. That being said, this is still a slight improvement over the last film because there are higher levels of tension this time round. The action scenes, as sporadic as they are, seem to have more weight to them amidst a more pressured context – whenever they’re being chased down by Jai Courtney or fighting a legion of aggressive types aboard a moving train (both of which come back-to-back, by the way), there’s a bit more of a intrigue to watching them which helps audience enjoyment more than before. It isn’t long, though, before it wraps itself snugly with an abundance of YA clichés and tropes borrowed from better movies. The whole “sinister dystopia” element has been used so many times now in these type of films, including this one, that even George Orwell would be calling for a democracy by this point; it even opens with a blatant rip-off of the Hunger Games movies, with Kate Winslet’s President Snow Jeanine Matthews fronting a fierce publicity campaign against the lead female protagonist. We understand that most YA movies have to appeal to a particular age group that favours darker and more mature subtexts, but when it’s not even trying to cover up its mimicry it just comes off as redundant here. The same applies for many moments in the film, such as when reluctant hero Tris (played once again by Shailene Woodley, only this time with a manic pixie haircut) must make a heroic sacrifice to save the lives of others, something similar to what Harry Potter decided to do nearer the end of his own series. While these tropes can work with the appropriate writing and directing, here they’re just too unconvincing. That’s not even before we get to the film’s ultimate climax, which seems to be something along the lines of Inception via The Matrix by way of Sucker Punch – and when you’re copying Sucker Punch of all things, that’s an unfortunate new low. Thank goodness, then, for Woodley who continuously proves to be this series’ MVP; though her character may have the physicality of Katniss Everdeen and the mentality of Harry Potter, Woodley undisputedly makes the character her own and continues to be a highly watchable lead because of it. She also gets her fair share of emotional scenes, no doubt perfected after her role in last year’s more successful The Fault In Our Stars, which allow her to explore Tris’ ever-growing guilt brought about by the sacrificial tendencies of her parents from the last film’s climax – though it seems only Ashley Judd, reprising her role as Tris’ mother in dream sequences, made an impact to her as her father is nowhere to be seen; favouritism, we suspect – as well as several of her colleagues. Her relationship with Theo James’ Four isn’t truly tested this time round, though perhaps they’re saving that for next time, but her emotional journey is honestly far more interesting anyway. Two films in now, and what have we learned about the Divergent series, as the marketing is having us know? It’s certainly no Hunger Games, nor is it pandering drivel like Twilight or The Host– it straddles that middle line without a clear sense of which side it should favour. Either way, in a time when YA adaptations are becoming more and more prominent with The Maze Runner and the like making an impact, being somewhere in the middle isn’t the best place to be right now; it can be very easy to be caught up in everything and likely not make as big an impact as The Hunger Games did before. Such a forgettable fate is most likely for the Divergent series at this point; if you even remember a little from the previous movie going in to Insurgent, then perhaps you have a bit too much faith in it. Not that there’s anything wrong with that, but by this point there’s not much worth getting too invested in at all. Insurgent doesn’t do much to elevate The Divergent Series to as prominent a YA adaptation as The Hunger Games, using a few too many clichés of the genre that not even Shailene Woodley’s strong performance can save, resulting in a series that is slipping further into obscurity with every new entry.